"The Soloist" strikes me as a very special film handicapped by unfortunate marketing. Dreamworks seems unfairly bound to promote the feature as a feel-good snapshot of redemption, spotlighting the road-tested appeal of the privileged white man taking a handicapped black soul under his wing, guiding him to unimaginable greatness. "The Soloist" is not that film. Under no circumstances is this picture a perverse "Radio 2." Put the marketing aside, block the promotion out, and absorb this feature for what it truly is: a masterful observation of genius trapped inside unimaginable distress. The studio would like to sell a candied inspirational story, but director Joe Wright avoids the sugared path at all turns, producing a stunning, transcendent celluloid event that fuses the tranquility of classical music with the unyielding frailty of humanity. 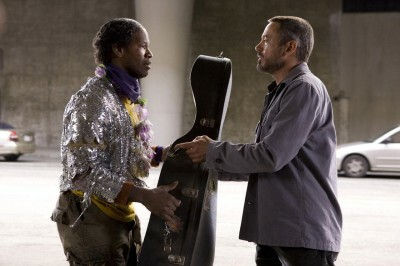 Recouping from a rough day of accidents and professional self-doubt, Los Angeles Times journalist Steve Lopez (Robert Downey Jr.) stumbles upon the impressive musical skills of homeless man Nathanial Ayers (Jamie Foxx). Striking up a conversation with the visibly disturbed man, Lopez begins to piece together fragments of Ayers's prestigious history as a gifted cellist, admirer of Beethoven, and once promising student at Juilliard. Finding inspiration for a series of cover stories on Ayers's fractured reality and the alarming conditions made available to the city's homeless population, Lopez finds colossal success, which inspires him to reach out and attempt to cure Ayers's afflictions with medicine and invasive psychological probing. However, the attention pushes Ayers to retreat further into his mind, to find a place where his demons can be held at bay and his virtuoso gifts can be permitted freedom. "Pride and Prejudice" and "Atonement" presented Wright with a cinematic forum to craft recognizable, perhaps clichéd acts of tragedy and conflict, yet the filmmaker never provided simple emotional resolutions. "The Soloist" is another easy layup of a story, observing the worry of the mentally damaged genius led gradually to artistic enlightenment. Again, Wright routinely dismisses formulaic comfort, and his work on "Soloist" confirms the obvious: he's one of the more gifted young filmmakers in the business today, blessed with a capacity to articulate striking crisis through a generous lens. His characters are rarely served redemption on a silver platter, and "The Soloist" is brought to towering life by this desire on Wright's part to make the audience feel tightly intertwined in the bleak circumstances facing both main characters. A true story melted down to screenplay size by Susannah Grant (based on Lopez's book), "The Soloist" is a familiar dramatic creature within the set-up of the relationship between Ayers and Lopez. Characterizing the men as unlikely comrades, with the journalist's dogged curiosity becoming the tie that binds, the film solidifies intent immediatley, underlining Lopez's fixation and Ayers's mystery in the first act. What fascinated me about "Soloist" is how unexpectedly the film transforms into visual and aural poetry, with Wright using orchestral cues to gaze into the unknown of Ayers's mind, where beautiful peace still resides, just waiting for instinctive performance behavior to be unleashed. The impulse is gorgeously realized in a moment of bliss as Ayers's symphonic thoughts turn into a swirling display of colors that seize the film for a few minutes of sensorial immersion. Wright is known for a few bravura acts of filmmaking here and there, and "Soloist" is a handsomely assembled feature film all around. The director composes superbly complex shots of horror and ecstasy, attempting to pull the audience into the suffocating positions of the characters, exploring their depressive weight and frustration, but also their flashes of genius. While lovely to explore visually, the story is still attended to, most directly in Lopez's journey to the slums of downtown Los Angeles: a hell on Earth that contains claustrophobic masses of the suffering, the violent, and the forgotten; souls unable to find their place in the general populace. Here Lopez starts to absorb a larger portrait of Ayers's developing battle with schizophrenia and perfected isolation, searching for some sort of solution. A ridiculous notion of a cure. Watching Downey Jr. and Foxx graciously and effortlessly capture the uselessness of such an idea is how the film elevates to a riveting pulse of discontent. There are no simple answers for these characters, and Wright doesn't pretend that kindness always has a specifically cheery reward. The complexity of generosity and the dissatisfaction that follows infuses the picture with passionate confrontations of self, again brutally realized in the poised performances. As Ayers and Lopez struggle to mend their fractured communication and build toward a common psychological harmony, "Soloist" eschews the temptation of a hysterical climatic build to close as softly as it began. After all, this is a relationship founded on ethereal orchestral wings, and Wright respects and urges "The Soloist" to assume the same dignity and spellbinding poignancy to match the grace of the music that inspired it. Buy tickets to "The Soloist" now!